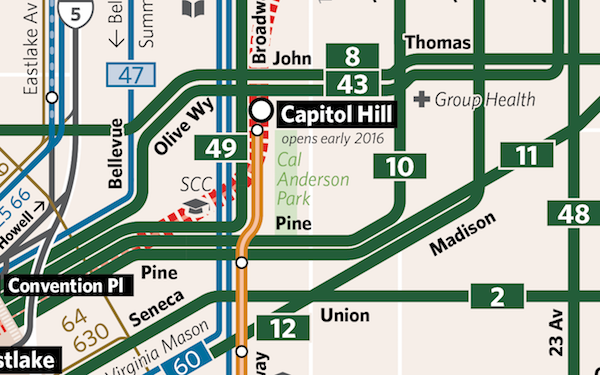 [UPDATE March 25, 2016] the March edition of the map is now available at seattletransitmap.com. Paper copies of the map are also available from SDOT, Transit Riders Union and Sound Transit. Please contact them for details on getting a map. Maps and posters will be available for purchase from the map’s website in the near future. Not since the early days of Seattle Metro has there been a definitive map of transit in the city of Seattle. As Metro’s map expanded, the city became a smaller part in an expansive countywide network. Details were lost as the city was scaled down to make room for the county. Metro’s latest maps tried to correct that by creating larger scale subregional maps but there still is no single rider-oriented map that shows the city’s transit network in its entirety… Until now. 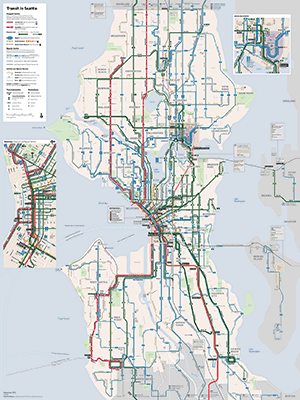 Today I am proud and excited to introduce to you a draft of my latest work in progress: the Seattle Transit Map and Guide, a map of transit for the city of Seattle. 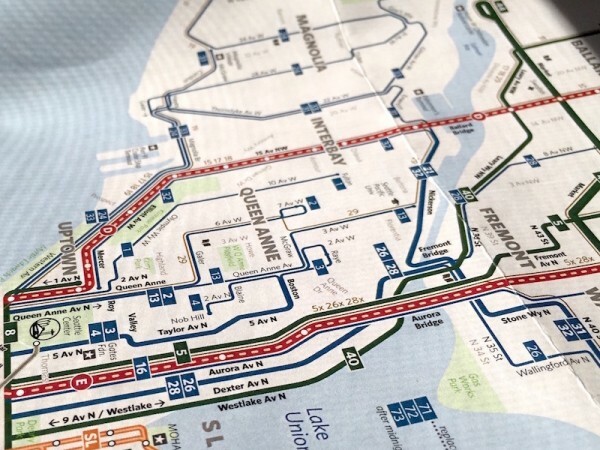 The Map features the entire network of frequent service, regular all-day service, and peak-only commuter service in the city, all on a single stylized-geographic map, plus a few specialized maps showing detail of busy areas or certain services. The Guide summarizes the frequency and span of all service in a few tables. Currently the Map and Guide depicts service effective September 2015; a draft depicting March 2016 service will be released when it is ready. You can view the draft Seattle Transit Map in a mobile-friendly website. There is also a PDF for offline viewing. I am collecting your feedback on the content and design which may be given in the comments below or on the map’s feedback form. Your feedback will help refine the map to make it ready for publication in March. Unlike the Frequent Map, it is not designed to be printed at home because I wanted to show more detail without making everything too small. In a pilot project with the Seattle Department of Transportation (SDOT) and the Transit Riders Union (TRU), we are aiming to distribute paper copies of the map for Metro’s big March 2016 service change in conjunction with the opening of U Link. In the meantime, TRU has paper copies of this draft available for anyone who would prefer to give study and give feedback on a handheld copy. Though to be clear, this is not an official SDOT transit map. Not yet anyway. The map was a long time coming. I made a concept in 2009 that went nowhere until late 2014, when TRU approached me with their ideas of more accessible and easier-to-read transit maps. Encouraged by their support and in collaboration with CHK America where I work, I spent a lot of my free time in 2015 creating a city transit map that I hope is a pleasure to use and look at. There are a number of design features that I would like to highlight. Current best practice for transit maps is to reveal the network’s usefulness to the customer. This often means showing service frequency and span intuitively. The map does so by grouping service into three main categories: frequent all-day service, regular all-day service, and limited service. Line weight and color work together to create a visual hierarchy of service. The trend of maps I have recently worked on is to design them as a friendly overview of the transit system rather than an overly detailed trip planning tool. In an age of real time arrival and instant super detailed trip planning apps, this makes sense, as those tools are not designed to show the big picture. I want the map to help people discover where transit goes in the city and what parts of the city are accessible by high frequency, high quality transit that they don’t have to think too much before riding. Thick lines represent the frequent network, which I define* as any line with 15 minute frequency (or better) from morning to 7 pm, Monday through Saturday. Routes with 10-12 minute all-day service get an even thicker line. Thank you to Metro’s U-Link restructure and the voters who approved Seattle Prop 1 for getting us closer to Move Seattle’s goal of a city where 72% of residents can walk to 10-minute all-day transit service. A blue medium-thickness line represents all-day routes which run every 20-60 minutes during the day. Corridors where multiple routes are scheduled together for frequent service combine into a single thick line. A dark route badge indicates the route runs seven days a week, whereas a light route badge indicates a route runs on weekdays only or has no Sunday service. These concepts are borrowed from Washington, DC’s bus system maps and Spokane Transit’s system map, both of which CHK redesigned in 2012 and 2011, respectively. A coffee colored line represents the peak-only commuter routes. Unlike the frequent and regular routes which have a line for each route to make them easy to trace, the peak routes get a single line per street. Because nearly all these routes are focused on getting people to either downtown or the U District, this should be sufficient. Their limited service hours call for reduced visual emphasis on the map. The visual weighting follows to the typography as well. Streets and lines with more service get more prominent labels. *A slight variation on Metro’s definition. I am aware that the suburban routes (except 550) are not frequent on Saturday. As mentioned above, each frequent and regular route gets its own line. This helps the reader trace a route across the city and reduces the occurrence of “shield hunting”, where readers get lost trying to follow a path on the map and have to rely on the route labels (or shields on highway maps) to figure out the route. This is a major shortcoming of my Frequent Transit Map due to the challenge of compressing the entire city on to a letter-size sheet of paper. Another benefit of separating the lines is being able to show overall level of service on a street. On this map, it is very clear that Aurora, Jackson, Pacific, and Pike/Pine (excerpted below) have ultra-frequent service. However, there are exceptions. It is impossible and undesirable to show each route running through downtown separately. At one point on Third Avenue there are over two dozen routes. You would have a hard time finding individual routes in all the clutter. It is a similar situation for the freeways where many routes run non-stop for long stretches. I didn’t want to dedicate precious space showing service that you can’t access. Instead, routes are consolidated into fewer lines. The map attempts to stay true to Seattle’s unique geography while simplifying lines to make them easier to follow and more aesthetically pleasing. Each kink in a line adds to the mental effort a reader needs to process information, called cognitive load. But remove enough kinks and the result would conflict with most people’s mental model of the city, also called “looking wrong”, or distort distances so much to be misleading. It is a delicate balancing act. The shoreline has been smoothed out; showing every single pier and dock and little cove on a transit map is a distraction. Seattle’s streets are laid out on a grid, so the map embraces it. The map presents an idealized version of it, sticking to a few angles, straightening streets, and aligning streets to the grid for even spacing. If you open the map on your phone, you can use its GPS to indicate your location on the map to a reasonable degree. During development of the map, I sampled colors from objects and places that that are symbolic of Seattle and the Northwest. Objects include Puget Sound, smoked salmon, coffee, Rainier cherries, coast rhododendrons, moss, sea otters, and grey skies. It was a fun exercise but not all of them made it to the final map. Try to spot and name the colors that did! I feel it is important that a transit map not just be functional but also reflect the place which it represents. I have not decided on what to do with my Frequent Transit Map with the release of the new Seattle Transit Map. Most of my free time is being spent developing the new map and I do not know whether it is worth keeping the old map up to date. There are several possible directions it could go: it could be updated to the March network, some of the work has already been done; or it could be abandoned in favor of the new map; or it could be redesigned to be a companion to the new map, although it will take some time after the March map is completed. Let me know what you think. When do the NE Seattle changes take place (March?)? Are you going to update it then? I woud assume that the “March map” referred in the article is exactly the map you are asking for. That is correct. I’m already working on it. Oops. I didn’t read it all. Thanks for all your work, Oran. VERY WELL DONE!!! You clearly put a lot of time, thought, and effort into this. It isn’t terribly useful to me given my location out here in the burbs of Tacoma, but Seattle riders, especially newbies, will find this very useful. Kudos!!! A piece of constructive criticism from south King… on the green line linking Kent to Southcenter, there is a node labeled “West Valley.” I’d simply omit that node. West Valley is a road that runs north and south from Tukwila to Sumner, passing through Tukwila, Kent, Auburn, Algona, Pacific, Sumner, and portions of unincorporated Pierce and King counties. The tail end is at the Sumner/Puyallup city limit. It isn’t necessarily a “place”, so this could be confusing to a newbie or visitor trying to use this map. Still… this is such a minor comment for a map that was so well-done. Thanks again for your hard work. 1) Increase the size of the map to take up more of the screen. Also, move the legend to a navigation bar off to the side, so it is always visible as you scroll through the map (as opposed to have to scroll to one particular part of the map to see the legend). 2) Increase the level of detail when you zoom in, to show more of the local streets (and staircases) than what is visible in the default view. 3) Click a route to get more information on it, for instance, look up the schedule. 4) A checkbox to show/hide individual bus stops. 5) A switch outside the map to adjust the thickness and coloring based on the desired time you’re traveling. The categories to switch between could be the ones shown one the back (day/evening/night). Would a switch to OpenStreetMap allow 1. and 2.? Agreed Harris County (Houston) has a pretty cool map like this that allows you to toggle routes on and off. Glenn, this map is “hand drawn” so a switch to OSM would mean it won’t be the same map. Out of the box, you lose all the benefits of simplifying line work and purposeful displacement to show areas/individual lines more clearly. It would be nice if OSM/GIS can do that on the fly but like I said, we’re not there yet. I did not pursue a pure GIS approach because I felt that a lot of people are capable of doing that while few people can draw a great hybrid-schematic map like this. That was the best use of my limited time. 1) you can view the map full screen (and save as a web app) if you follow the link under the viewer. Moving the legend off is a good idea. 2) I have plans to do that for downtown and the U District, to eliminate the need for insets on the online version. 4) not really feasible due to the geographic simplification unless you don’t mind stops showing up in the wrong place. The best I could do is to send people to OneBusAway. 5) would be A LOT of work (basically drawing three maps). Ah, I didn’t realize that the maps were all manually drawn. I just assumed that they were constructed by software using a combination of data from OpenStreetMap and the KCM GTFS feed. Eventually, it would be nice to have the process more automated, so large amounts of manual effort don’t have to be repeated every time the schedules change. But, I guess current technology is not quite ready for that, at least not without compromising on certain qualities like geographic simplification. Anyway, all the stuff I listed is mostly nitpick. This is a great map and will prove useful for a lot of people. The mobile friendly map won’t open on mobile (ios9.2). I use iOS 9.2 personally and it’s been working for me. Thanks for all your work on this. How do we get SDOT/Metro/ST to understand that things like this should be a matter of course rather than a volunteer effort? Metro has a feedback address on its website. Email them and tell them you want a map like Oran’s, link to it and tell them what you like about it. Great map, Oran. Thank you all your hard work on this. The only part I didn’t understand is the Night Owl Map. Why is the 120 green while the 124 is blue? These colors don’t seem to correspond to night-owl frequency or span. Some more text explaining which hours the map applies and what frequency each color mean would help. And perhaps a linetype modification to show which routes truly run 24hours, and which shut down between 2:30 and 4:30 am. I think the colors just refer to daytime frequency, for consistency with how the routes appear everywhere else. Good comment, Chad. Because the night service is so different from the day and service levels vary wildly, different use of colors might be worth considering. Morgan is right on why they are colored that way. I want people to know that it’s the same route during the day. Along with the great information you manage to get onto a single map, a quick glance shows the transit wasteland that is NE Seattle (and, no, Northgate is not part of NE Seattle). A topic for another thread, but this is the kind of thing that shows exactly why better transit to that area is sorely needed and why a 130th Street station and some form of frequent, Rapid Ride transit up the Lake City corridor is well worth pursuing. They had that right in 1968. As you know, I was impressed with CHK America’s work in Phoenix and, as a design professional and inveterate traveler, transit maps and wayfinding in unfamiliar places are both of academic and practical interest to me. I really admire your work in this regard and am glad you have found a place to pursue it. It can make a lot of people’s lives much easier. If Northgate is excluded, what is included? Lake City? Olympic Hills? Or are we too far north to be considered part of NE Seattle? And better yet, which quadrant of Seattle is Northgate part of? Look at that map. Northgate is in the heart of N Seattle; it’s about as close to Crown Hill or Greenwood as it is to Lake City (and, of course, Lake City and most of Meadowbrook is north of Northgate for whatever that’s worth). There is a major topographical feature between 15th and Lake City Way that is both a real and a psychological divide between Lake City/Meadowbrook and Northgate (there are only two arterial lanes of traffic running E-W over that divide between 80th and 145th, as an example). Anyone saying “See? Link Northgate serves NE Seattle!” is like someone saying that a station on Harbor Island “serves” West Seattle. I lived in NE Seattle for 40+ years and my parents did before me, and you went to Northgate to shop–otherwise it was a place to be avoided due to the barrier and the traffic around the mall. My friends in the Northgate area only came “down the hill” if they went to school at Hale. The two places are not the same and never really have been. Yes the divides are pretty significant, and they also make bus service very difficult. (Especially East-West across the hills). Its not ideal, but the new service network coming in March will have significant service reorganizations along routes 75, 65 and 372x which will have at least readable, fairly frequent service for most of the week. Do you find that these services are going to increase your transit access? I no longer live in the area, although I do still have property there; generally speaking I think the service changes are good ones for NE Seattle (and as a former frequent rider of the 75 it had pretty decent service before). With relatively few NIMBYs, reasonably affordable in-city property, good connections to the north and a large amount of flat, non-view-blocking property primed for re-development Lake City is going to continue to grow quickly. A seamless transfer at 125th/LCW to the 522 (and the 372, although I rarely used it as I was typically going downtown) from the 75 is a big deal and I hope a predecessor to more “Rapid Ride” like amenities. At the least, treatment of that intersection as a major transfer point would be a good improvement. Back before the service increases on the 522, it always seemed that it had just passed when the 75 showed up! It’s convenient to call “northeast Seattle” the low-density area east of 15th and north of University Village, because it really is a contrast with the rest of the city. Lake City and Pinehurst are higher density but they’re only a small part of it so the general principle holds. I don’t know if I would draw the line at U-Village. The density surrounding 65th east of 15th is not that much different than the density on 65th and 8th NW. I would say there is a big gap in density north of 75th, but south of Northgate or Lake City. That stretch along Lake City Way is pretty barren. There is one little area (around 80th) that has moderate density, but everything else (for quite a ways) has very few people. There is no equivalent of Greenwood, which extends as a fairly dense area quite a bit north. That is partly why Link has no stop between Roosevelt and Northgate, and why building light rail to Lake City (which is one of the more populous parts of the city) is so problematic. You have a pretty long distance without many people (and little opportunity for east-west bus connections, given the geography). Good points, Ross, although I think provision should have been made for a future station–mainly for transfers–where Link crosses Lake City Way somewhere between 75th and 80th (IIRC). This would have been a good location to intercept not only traffic from the north and potentially E-W traffic as well, since as you note there is really no E-W connection possibility from there north until 125th. We’ll see how Roosevelt works but an infill station down the road wouldn’t necessarily have been a bad idea. I agree, Scott. Adding a station there (or a spot for a station to be added later) would have made sense. As an Eastsider, I think of NE Seattle as anything east of I-5 and north of the Ship Canal. After all, all the streets and avenues are labeled with NE there. My only question is when I can buy a laminated pockets sized version at my local convenience store. Excellent work Oran, as always. We’ll see where we go after March. It would be cool to have a waterproof pocket version. Take that smartphones! This looks really good! It’s much more informative than the existing King county metro maps. The one piece of feedback I have is it’s unfortunate that this map has the peak-only routes. What I really liked about the frequent transit map is that it’s useful for tourists and people who aren’t commuters. It’s a bit harder for this new map because there are all of those lines and routes that are functionally 100% useless to anyone except commuters. Personally, I would much prefer a map that focuses on the all-day network only. One of the advantages of doing that is then you could use the color/styling that’s currently being used for peak-only routes to further differentiate the lines that are currently blue. For example, the “regular” routes have some pretty divergent service. Some run every 60 minutes, others every 20 minutes. I would find caputring that difference more important than the peak routes. A vote for keeping/expanding the frequent transit map. Thank you! I also think a variation without the peak-only routes would be useful. That would cover a niche between the all-Seattle map and the frequent map, and could replace the frequent map if the infrequent lines are unobtrusive enough to be ignored. The all-day map is the baseline reference for people’s general future; the routes they need nor or might need anytime. I like the frequent map and committed it somewhat to memory, but Seattle has too many frequency-barren areas to go by just it as a pocket reference for the entire city. Peak-only routes play a more specific niche. One, they’re completely useless to many people, including visitors, reverse commuters, and shift workers. Two, people don’t really want to see all the peak routes very often; they just want to learn more about the one or two routes in their area. For that, Metro’s neighborhood list works pretty well; I use it; e.g., to see all the routes from Kent and where they go and which are all-day. Or I keep forgetting whether it’s the 347 or 348 that goes to Mountlake Terrace or Richmond Beach, so I look at the “Northgate” section and can quickly find it among the sixteen routes, and at the same time I can also see where the other routes go in case I need one of them someday. The listings are more detailed than just “to X via Y”, but not the specific streets, just the neighborhoods. That can’t fit on a comprehensive two-page map, but maybe it should be made into a separate handout. Another thing, as Mark Y asks above, people will be asking Metro to make maps like this, and they’ll also want maps for outside the city limits. As a volunteer project Oran can’t necessarily do suburban maps or Pierce/Snohomish maps, but in general that’s the next level for this kind of information, and also there will people in the city wanting to know how to get to places outside it, or wanting to know what places “North” they can get to on transit. So we should in general be thinking how to address this, in case Metro and ST don’t step up to it quickly enough, or even just to quality-review whatever they do produce. This seems like a huge step up from anything I have seen before for Seattle. Nice work. The one issue I have: as a person who very rarely rides transit, I don’t feel like the legend makes sense to me. In your description in this article you explain that line thickness denotes frequency and color denotes service hours. However, the legend’s categories of “Frequent Service”, “Regular Service” and “Limited and Special Service” break up this information and makes it difficult to understand. To my mind, I would like to see the legend be 3 sections. First section shows line types and colors. This would show the line styles for Link, RapidRide, Street Car, Ferry, and Bus, with all of the colors for buses listed and explained. The second section shows line thickness and explains how this relates to frequency. The third section shows a list of symbols and is unchanged from your “Transit Amenities” and “Destinations” sections. Thanks for your impressions. I’m always curious about how people interpret a graphic. I’ll have to rework the legend If I go ahead with adding a slim line for hourly routes. The line thickness is mostly consistent across modes (monorail is the exception). The colors are used to reinforce the 3 categories and mode so you know the difference between the 26+28 and 40 frequent corridors, what is rail and what is bus or RapidRide. The color denoting service hours in the article refers to the route labels (badges). Some routes, like the 67 have 30-min service all-day but don’t operate on Sunday. That cannot be communicated with line thickness or color so I show it through the label colors. I thought the 3 categories are what most people would group service: the frequent ones that you can just show up and go, the less frequent but all-day ones you can depend on with some planning, and the oddball/specialized ones. I am thinking if the thickness was separated from the line styles, people would have to look at both sections to figure out what a line is all about as opposed to one section. There would be redundancy (not always a bad thing) because some services will always appear in one weight. Link and RapidRide will never appear in anything but the thickest line. Peak-only commuter services will always be the thinnest line. I really like this approach (of using labels for showing which routes aren’t 7-day). Ideally we wouldn’t have any normal routes that aren’t 7-day, but given that’s the world we are in I think this is a great compromise. Thanks for the reply. I suppose as a rare rider of transit, I don’t draw exactly the same distinctions between route types as many on this site. To me, mode is the biggest distinction between types of transit service. Also, I definitely see your point about having to look two places. The engineer side of my brain (which is most of it) like the clarity of the two sources for the two types of info, but maybe another solution could be reached. Looking at the map again after reading your response, I have another set of ideas. I’ll have to flesh them out and get back to you. Oran, I’d just consider Frequent Transit Map version 1.0 and this Seattle Transit Map version 2.0. No sweat, job well done. Really like the focus on frequency! It looks great! It’s easy to read an well-labeled. Thanks for your dedicated work! Graphics are more time-consuming than anyone realizes unless they’ve tried it! I’m glad that you show actual distances on the map; that’s in contrast to the latest version of SDOT transit planning maps which shrink South Seattle distances in half. Your work also demonstrates the confusion of having a Link “red line” at the same color as RapidRide. Thanks for showing some variation on color (although the ultimate solution is for ST to make the red line green — just like ST is proposing to do for Central Link south of IDS if ST3 passes anyway)! One minor addition: Can you add a way to represent station entrances and exits? It would help when someone is trying to figure out how to get in a subway station because it’s not as evident on the street as a bus stop pole or shelter is — and it can be a block away from where the station dots are located. The ST3 colors are doubtless only for planning; they aren’t necessarily the actual colors. I’ll take part of the blame for the SDOT maps because they used my frequent transit map as a base. On my map, I thought (in 2011) it was necessary to compress South Seattle to get all of the frequent network to fit on an 8.5×11″ sheet of paper without making it unreadable. That’s not the case with SDOT’s RapidRide+ map. Taking off much of the lines makes it pretty clear how unbalanced it is. It needs to be redrawn to suit the purpose. If I do redesign my frequent transit map, I’ll try to make it less lopsided within the constraints. CHK faced a similar problem when it redesigned the Washington DC bus map. We wanted to use more colors for bus service but that clashed with the colored Metro lines. So we made the Metro lines a thick black line (to say this is a major transit line!) and indicated at the stations which colored lines stopped there. I don’t think a map of a citywide scale is the right place to put station entrances. I have tried adding them on the downtown map but removed them because they were cluttering to me. Maybe I should try again? That people cannot find a station entrance from the street is an epic failure in wayfinding design. which merits a post of its own. I’ve been holding off on that because I want to see the purported improved station signage for U Link. I don’t have high hopes. I actually had the same thought when I saw the downtown inset (eg that the station entrances should be visible). I agree that ideally you wouldn’t need that but unfortunately it can be hard to find stations today. I can see why it would be hard to put on station entrances on the map. It’s merely a suggested possible addition. I would agree that several station entrances are not very clear on the street. Many entrances have signage that is not clearly visible from the sidewalk when someone is a half-block away. It’s not a big deal when subways have entrances in the sidewalk space because they are easy to spot a block away, but when they are recessed like they are in Seattle, they are much harder to distinguish. One idea for ST would be to erect a pole with a sphere in the sidewalk similar to the streetcar end-of-the-line pole on Broadway.. I’m sure there are others. Anyway, that’s not the topic of this post. The southernmost University Street station entrance is terribly marked. You have to be practically inside it to see the signs; from a distance it looks like maybe a Starbucks or an office building entrance. But I would love to have an updated version of the Seattle every 15 minutes or less map. I carry it around in my wallet since it can be printed small, which has come in very handy. I don’t see how this map could be printed that compactly. I just remember where the edges of the 15-minute network are. E.g., the 26/28 split at Fremont; the 31/32 split at Emerson Street (or Fremont as far as I’m concerned) and 36th Ave NE in Laurelhurst; the 347/348 split at 145th; etc. So going within that area is easy, while going outside it is harder. Thanks for your support. That is why I designed the 15 minute map to be printable practically on any printer. You could print the city map on an 11×17″ sheet and fold it down but it’s not very readable. The printed version of the city map is about 18×24″ folded down to typical brochure size, about half an inch larger on each side than a Metro timetable. Yeah, I’d like a copy of this map as well, but I LOVE your 15 minute map. For the 15 minute map I’ve printed it double sided on an 8.5×11 and then cut in half (since it flips this gives me the full map). So then I end up with an 8.5×5.5 piece of paper than can be folded further that has all the frequent transit connections in Seattle! I love it! I like your map. I think it fills a great need against the Sound Transit Regional Transit map book. 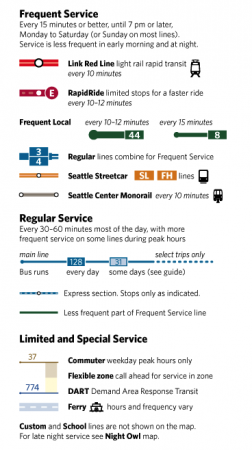 Especially like the headway minutes chart, where in the ST map book, Seattle is too constricted, and its Bus Routes and Hours of Service charts it only tells you if it runs, not the headways. The Seattle downtown inset isn’t bad, but I would like to see a much more detailed Seattle downtown map. Until we get away from a radial system and to reasonable grid (or even what would look like a tomato cage) system, most trips will involve downtown, as unfortunately it is often more convenient to go downtown, and connect up. Consider that it be published as a map book, rather than trying to get everything in on one large fold out. I was sad when Metro stopped providing a chart of headways for all routes. The service guide to frequency is a great companion to the map, perfect for when you need a bit more info than the line category, but don’t want to pull up a full timetable or plug something into a trip planner. The size was one of the very first specs I had to decide on because it affects how economical printing it will be and how much detail I can show. It can’t be too big because it will cost more and be inconvenient to carry around and use. It’s like all those broadsheet newspapers that went to a more compact tabloid format. It can’t be too small because there won’t be room for a readable map. I don’t know how much it costs ST to print the map book but I guess it’s a lot more than a folded sheet of paper. Also, people love to hang the bike map on their wall. I’d like people to be able to hang a transit map on their wall. Awesome job! I wish the trip planner would use it to animate a route once selected. Or at least have the trip planner show a map of selected stops/transfers. Wasn’t there a booklet a while back that did something like this with split up maps for the Sound Transit area with schedules for all routes? Is it still around in any way? There is something called the Sound Transit Regional Transit Map Book which was dependably available at Union Station. Its date was February 2014. I don’t think many are around any more; they would be completely outdated March 2016. A few copies can be found at Westlake Station if you’re lucky. I would suggest, however, to remove Fremont and Green Lake as destinations served by the E Line. Perhaps “Woodlawn” could replace Green Lake, but a name for 46th & Aurora is admittedly more difficult. Green Lake is fairly descriptive of the green lake stop, Its just right across the street after all. I guess you want to call it “Bongos” after that restaurant that was put in where the old gas station used to be. Woodlawn isn’t very descriptive, as Woodlawn street is on the opposite side of the lake. There is a feedback form on the site… The pioneer square area is missing 1st ave and the nbound 16 & 66. Probably more nits too. I wanted to let you know that I posted the map over on the Seattle subreddit. Feedback there has also been overwhelmingly positive. I’ve pasted a link to the thread below, as there are some additional bits of feedback or confusion if you are interested in reading through them. I’ll definitely print this out (on 11×17) and use it on my next trip up there. Thank you very much for the effort. I’ll probably combine it with the 11×17 Metro KCM downtown map that works pretty good for getting around the downtown core. The Transit Riders Union also has a few dozen advance paper copies if people would prefer to study the map that way. Contact them to get a hold of one. I’ve updated the post to reflect that as well. Studying it this way is fine. There’s a limit to how many times I can fold my phone to fit it into a smaller pocket and have the map easily available. Great map, like all your work Oran. But if you can sell this to Metro, ST, etc., please have the routes be clickable. When I see a route that takes me where I want to go, I should be able to click on that line (or rt. #) and be taken to a timetable. Other systems have been doing this for years, so it can’t be all that difficult. For that to happen I need to figure out how to make the map interactive and encode all the lines and labels I drew with route information. It’s on the list but as a lower priority than getting the map to print for March. The quick and dirty would probably be an image map. I don’t know what you do for segments that have multiple lines on them though, as the destination URL could be any of several routes. Looks great! Just wondering though why the 3 & 4 to Harborview are so thick compared to other trunk lines? Because it really is that frequent. 3 & 4 combined run every 7-12 minutes on weekdays (if OneBusAway is to be believed). It’s because the 3 and 4 are timed so as to give even seven-to-twelve-minute headways together, while the 10 and 11 on Pike/Pine aren’t. Cool thanks, didn’t realize that. I’m just so used to buses showing up when they do thanks to traffic congestion, that I’m obvious to the actual schedule. You’ve marked that the 424 doesn’t serve either 520 Eastside freeway station. In fact, it serves Evergreen Point but not Montlake. Are you intentionally showing the night-owl 180 to not continue to Burien? I’m not sure of your standard for owl service. Finally, are there any DART zones shown on the map except for Mercer Island? If not, you might leave it out of the legend and make a special note on Mercer Island? … and by “Montlake,” I meant “Yarrow Point.” Yes, the 424 does serve Montlake. The West Seattle Water Taxi Shuttle also has a deviation zone. Point… except I don’t see that marked on the map? Oran? “773 DART Zone (M–F only)” down by Morgan Junction. I should use just one color for deviation zone but Metro calls one a “community shuttle” and the other one “DART” even though reservations both go through Hopelink. The early morning 180 trips to Sea-Tac leaving Auburn at 3 am do not continue to Burien. I’ll have to find a way to fix Pine/Madison. Has the ridership on the 99 dropped so low they cancelled it, or is it missing from the downtown map? It’s peak only so it doesn’t appear on the downtown map, which shows only all day service. I rushed through the downtown peak only route listing at the last minute before the print deadline. I had missed that they converted it to peak only. Great work on this. I especially like seeing all of the through-routes listed out, I don’t think I’ve ever seen the complete list before. One comment: While I realize you’re very limited for space, it would be nice to see some reference to Accessible Services under the “Accessibility” heading on the back of the map. Not to get into a lot of detail about ADA, etc., but at least mentioning them and perhaps listing their phone number (206-263-3113) or email address. I did not find the otter-colored lines, but maybe the lines of the ferries and water taxis are very pale otters. They hold hands at first, and then drift apart. This is a great map. I wonder if the routes on 3rd could be written in a way to give people more intuition of the skip stop system and the crazy through-routes: that said, the labels are probably already arranged to communicate something, and I’m not getting it, so this aspect is probably too hard to communicate on a map without a separate legend. I’ll have to look at the skip stop system downtown to see how it could be explained. The through routes are listed in a separate section of the map. On the frequent map it was a little box off to the side, maybe put that open space in the bay to use? I’m coming to the point of view that the numbers on 3rd are unnecessary since nearly every route runs on it. The explanation of through routes in general leave much to be desired. I’d really like a poster of this. It’s so cool. I have plans to sell an 18″ x 24″ poster after the map is finalized. Exactly what I hoped to hear. Thank you. Thanks for sharing your talent. Awesome map Oran. I would love to get printed copies of this and more after the March service change. One small change to suggest in future versions of your map. Route 107 from its Rainier Beach terminus shows an incorrect route. Outbound runs from Rainier Beach run on Henderson at Rainier Ave South like Route 8 and proceed on Henderson directly to the Rainier Beach Link station. The route you show south of Henderson on Rainier is only for the return routes.